The satisfaction of good grades is a reward in itself, but the added incentive of a special treat for doing well never hurts! 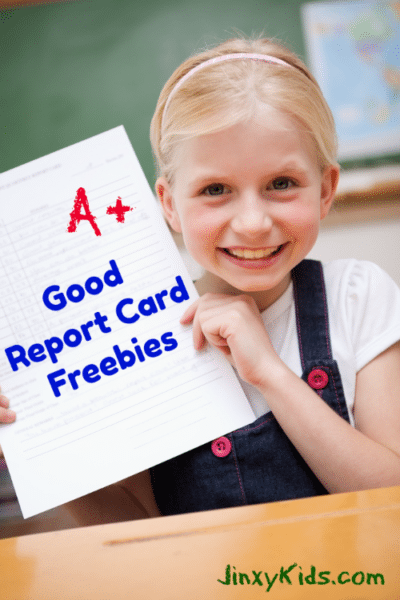 Kristie at Saving Dollars and Sense has created this great list of rewards your kids can receive for presenting their good report cards. It’s always best to call your local store/restaurant to ensure that they are participating. Bank Rewards – Check with your local banks and credit unions as many of them offer money rewards for good grades. Chick-fil-A – Bring in your all A’s and B’s report card and receive a FREE 8-pack nuggets! Call ahead to your location to see if they are participating. Family Video – Throughout the month of June, Family Video gives a FREE overnight movie or game rental to students for every “A” they receive on their final report card in any core subjects. Kudzoo App – Middle school and college students can download the FREE Kudzoo app and build Kudzoo cash to use in your favorite places, from restaurants to concerts. Earn the grades, scan the report cards then spend your Kudzoo cash! There is also a daily challenge round and coupons to help college students boost their savings. McDonald’s – If your child has a straight “A” report card, he/she can receive a FREE Happy Meal. This may vary by location, so call ahead first! Pizza Hut – Each marking period, any child who has 3 A’s or the equivalent thereof, will receive one FREE Personal Pan Pizza and a small soft drink or carton of milk by presenting his or her report card to the manager. This offer is good for Elementary and Middle School students. Dine-in only. Student must be present and the original report card must be presented. Available at participating locations. Thank you for compiling this list of programs. We will be hitting up a few at the end of the school year. This is pretty cool. Thanks for sharing, this is good to know about. Oh–that’s a great list! Sending it to my best friend as a “tool” to encourage her girls! I did not know that resteraunts do this. My niece and nephew are very smart. I am going to tell them all the free stuff that they can get. This is such a great incentive program!! It teaches the kids that hard work does pay off for the better! This was pin worthy!